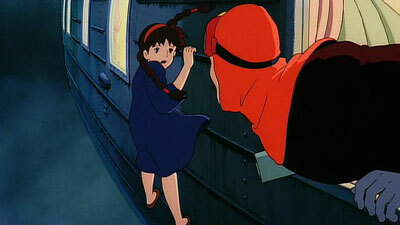 A boy catches a girl who has mysteriously fallen from the sky. Together, they lead pursuers on an exciting chase as they begin a journey in which they will discover the girl’s true origins and the secrets of a fabled castle in the sky. 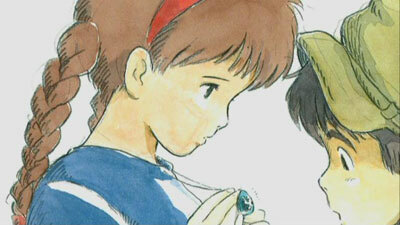 Following the success of the film Nausicaa Of The Valley Of The Wind, the publisher of the manga on which it was based created Studio Ghibli in order to produce more films by director Hayao Miyazaki and producers Toshio Suzuki and Isao Takahata (who would also direct films for Ghibli). The studio’s name was selected by Miyazaki; it comes from an Italian scouting plane used in World War II, an aircraft with which aviation enthusiast Miyazaki was familiar. 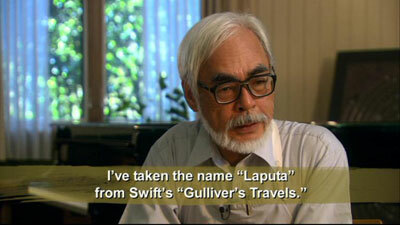 (However, being unfamiliar with the actual Italian pronunciation, Miyazaki gave it a “soft G” sound.) 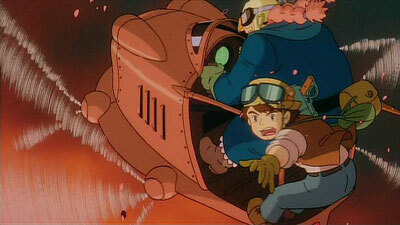 For their first Studio Ghibli film, they chose a straight-up adventure, appropriately incorporating aviation elements in the plot and action. 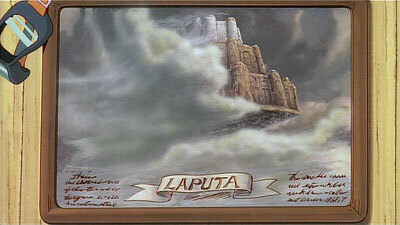 Its full title was Laputa: The Castle In The Sky (shortened in some parts of the world due to an unfortunate Spanish translation of the word “Laputa”). The film takes place on an alternate Earth, in a steampunk setting that features old-time engineering mixed with fantastic flying machines; the world and its machines are shown off nicely in a series of beautiful “woodcut” style drawings that play during the opening credits. 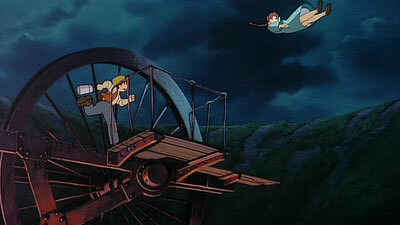 As the story begins, we see that on one such flying machine is a young girl named Sheeta. 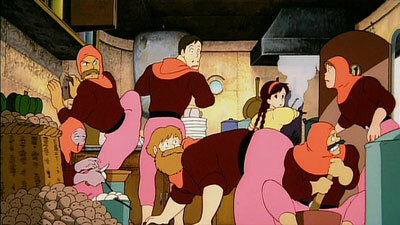 When air pirates board the ship, it becomes clear that the girl is their target. 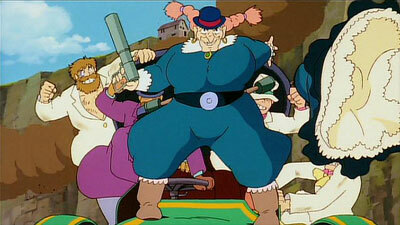 The pirates close in, and the girl’s guardian Muska attempts to protect her; but the film’s first twist takes place when she clobbers her protector and tries to make her own escape. It is apparent that the girl was already a captive, even as she tries to evade a new set of would-be captors. 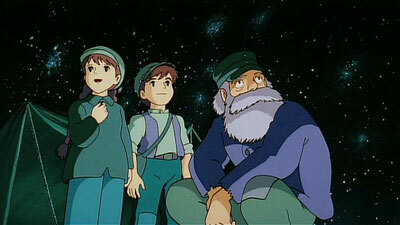 The children lead both the military and pirates on a merry chase, through the town and over train tracks, before they go down a mine shaft and meet Uncle Pom, who sheds some light on the mystery of Sheeta’s levitation stone, whose glow matches that of veins in the mine in which they stand. Pom claims that only the people of Laputa ever knew how to properly mine the element and form it into levitation crystals, which they used to create their floating city. The kids take this as evidence of Laputa’s existence, and become even more determined to find it. Of course, they first have to continue their evasion of those that seek them. They are far from successful, and have to spend time with both factions. Robots enter the story, the lost civilization of Laputa is revealed, truths emerge about each group that has been pursuing Sheeta, and we learn the secrets behind Sheeta and her crystal. 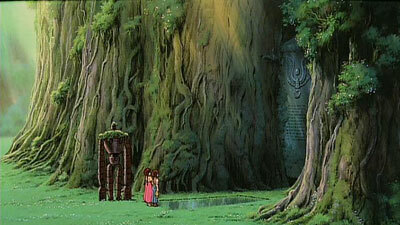 It’s fantasy storytelling in the grand tradition, with a Miyazaki twist. The twist comes not only from his boundless creativity, but also in his outlook, which comes out in all of his films. Here, he spotlights the conflict between man’s overreaching ambition and the necessity of co-existing with each other and with nature. The Castle In The Sky does not overwhelm one’s senses the same way that Spirited Away does, but it does entertain as well as any Studio Ghibli film. The unique world that is featured in the movie is both familiar and refreshingly new, making one wonder at times in which actual country the film takes place. The clean, clear storytelling is marvellous, making the job of telling (and selling) such a fantastic tale seem easy. The only extra in the bonus features menu on Disc One is the Introduction By John Lasseter (0:50), held over from the 2003 DVD. Disc One also has Previews, including those for Beauty And The Beast: Diamond Edition, Toy Story 3, and the current wave of Studio Ghibli DVDs. Further Sneak Peeks available from the menu include those for the Toy Story Blu-rays, The Princess And The Frog, Tinker Bell And The Great Fairy Rescue, Ponyo, Disney’s Friends For Change: Project Green, an anti-bootlegging spot called Genuine Treasure, Disney Movie Rewards, and Disney Blu-ray. Disc Two is devoted to all the meaty extras. 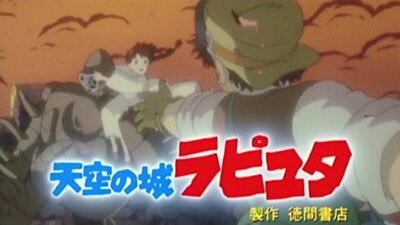 As with the 2003 release, you may watch the Complete Storyboards for the film, while listening to it in either Japanese or English, with subtitles available in English or French, as well as English captions. Then, we get to “The World Of Ghibli”, which is really a rich assortment of extras (though a little less impressive than those found on the Kiki’s Delivery Service DVD). 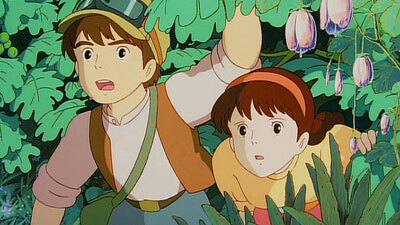 “The World Of Ghibli” is divided into two sections. Behind The Studio has materials that are in Japanese, with English or French subtitles, beginning with three short featurettes using interviews with Hayao Miyazaki and Toshio Suzuki. The World Of Laputa (2:20) has Miyazaki reminiscing on a trip to England, birthplace of the Industrial Revolution, to get inspiration for the film. 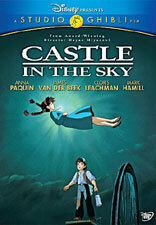 In Creating Castle In The Sky (3:42), Miyazaki discusses the themes in the film, as well as his influences for the film— Jules Verne, Jonathan Swift, and the Superman cartoon The Mechanical Monsters. Character Sketches (2:47) does have some sketches, but mostly it has Miyazaki discussing how some of his films (like this one) were not initially successful, but over time they have been money earners, which has allowed him to keep making movies for his audience. 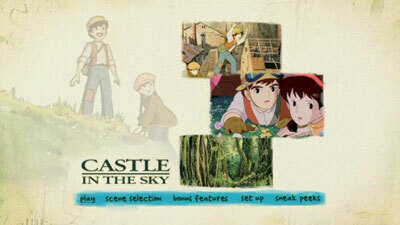 Then there are two featurettes which are not necessarily about Castle In The Sky. In Producer’s Perspective: Meeting Miyazaki (3:15), Toshio Suzuki reveals that he first came to know the director when he pestered him for a magazine interview, over the course of days. Scoring Miyazaki (7:19) is repeated on the other Ghibli DVDs in this wave, but it is still a nice interview with Miyazaki’s composer Joe Hisaishi. There are then a few Original Japanese Trailers (4:03). Behind The Microphone (4:12) features some of the voice cast of the English version— James Van Der Beek, Mandy Patinkin, Cloris Leachman, and Mark Hamill discussing their characters and the film. From another bonus menu entitled Other Ghibli Worlds Preview, Disney tries to promote its simultaneous Ghibli releases by also including Creating Ponyo (3:57), Creating My Neighbor Totoro (2:58), and Creating Kiki’s Delivery Service (2:26). By far the lesser of the main two sections of the “World Of Ghibli” bonus features is called Enter The Lands, which provides an interactive map with narration as the viewer is allowed to go through the lands and learn about the stories, characters and objects from Ponyo, My Neighbor Totoro, Castle In The Sky (with a personality quiz), and Kiki’s Delivery Service. There are further icons on the main map that go with other Ghibli movies, but these are not yet selectable, assumedly until the next wave of Ghibli DVDs hit. The standard keepcase comes with an embossed slipcover (which the original 2003 Disney release did not have). A tray holds a second disc. The cover has the new blue Studio Ghibli banner, with an attractive gold spine. There are three inserts: a “Collectible Litho” that has the cover art by itself, a Disney Movie Rewards code (though there is no indication of it on the cover), and an ad for Disney Blu-ray with information on their upgrading program. Unfortunately, Disney has re-used their original video transfer, which was clean but rife with grain, edge enhancement halos and ringing effects. My hopes had been raised by the corrected video in the new Kiki’s Delivery Service DVD’s end credits, but alas no such improvement is found on Castle In The Sky. You may not see the halos clearly on these small screencaps, but they are plenty obvious on a television or when filling a computer monitor. Additionally, the source used was fairly decent, but there are occasional specks of dirt that do show up. Colors never really impress, and overall the transfer lacks zest. The 5.1 sound is largely front-heavy and boring, but with occasional surprises popping up in the rear speakers. There is really no bass to speak of, and the whole audio experience is quite flat. This is far from an immersive experience, which is a little disappointing, considering the grandiose action in the film. One can forgive a less than stellar track from an older film, but there are bigger concerns with this DVD. First of all, the English language dub is lousy. Disney’s new script (well, originally from the 2003 DVD dub) has a number of alleged enhancements, which I did not find favourable at all. Too many so-called jokes and lame one-liners are thrown into the story, often written just to fill in silence in the original Japanese track. Also at issue is the decision to try to age the characters of Pazu and Sheeta. Although this track was recorded several years ago, even then actors James Van Der Beek and Anna Paquin were too old for their characters’ appearances. This is forgivable, but it all becomes way too creepy when adult pirates start professing love to what appears to be a preteen girl. In the Japanese track, they treat her more as a maternal figure. For this reason, I would recommend the Japanese track, even though it is only in 2.0. A 2.0 French track is also available. And then there is the subtitle problem. There are subtitles in English and French, plus English captioning. Unfortunately, Disney has re-done the English subtitles this time around. For the 2003 release, the English subtitles appeared to reflect the Japanese track, as they did not match what the English voices were saying, though the captions (for the hearing impaired) generally did. It made one realize just how truly annoying the English dub really was (though I knew that already). 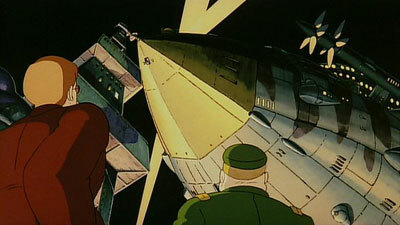 Now, one has no choice but to follow the sometimes-idiotic English dub, whether using the English track or subtitles. Disappointing, to say the least. This one is a tough call. It’s a great, inventive adventure film, but the presentation of it is not so great. The video and audio qualities are lamentable, the English dub is terrible, and this release even removes the previous English subtitles that were truer to the (much better) Japanese script. 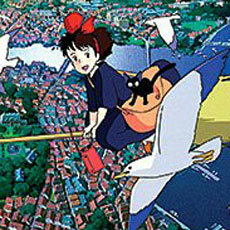 The extras are nice, but lack a really great one, like Kiki’s travelogue. So, I would say that most fans may wish to hang onto their old 2003 copies; but if you don’t have the film yet, this version will have to do.